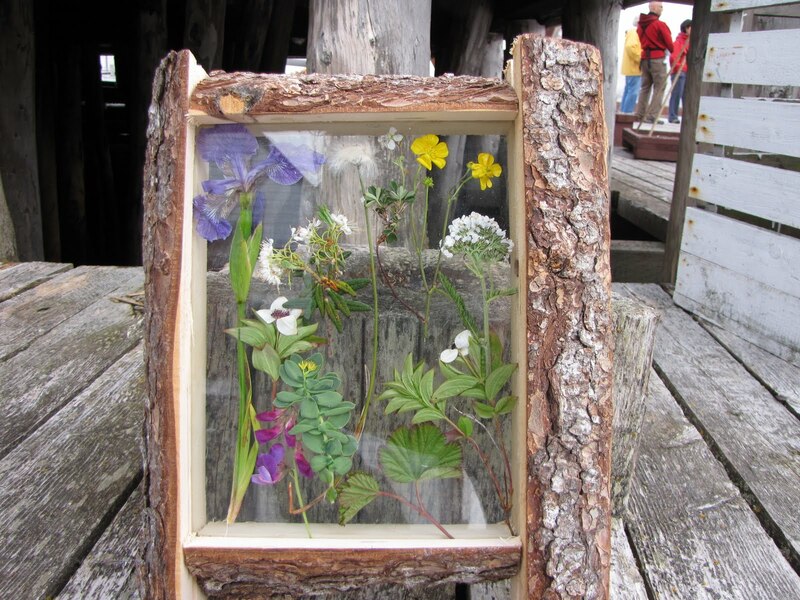 Part of my final days at Battle Harbour was spent making frames for wildflowers out of scrap wood and window pane glass. IT was an idea that came to me and I experimented and it came out nice so I gave one to a couple celebrating their 50th wedding anniversary at Battle Harbour. Then I gave one to a couple who had been returning to the island for 20 years. Then I gave one to a couple who stayed for two weeks every year. These were VIPs. I made one for the store and I kept one for myself to see what it would look like. I can't seem to find the picture I took of it so here's a drawing. The idea was to rip out a bit of the frame so the two panes of glass would fit in the groove. Then glue the pieces together using pipe clamp. It took a few broken panes of glass to figure out the procedure. Everything was going good (Step 1-2) until the final frame when my inexperience with table saws caught up with me. The push stick jammed the blade (step 3-4) and shot back into my hand (Step 5-6), carving out a nice deep gouge that was bad enough but then the piece of wood I was ripping was no longer being pushed so it shot into my stomach (steps 6-8) as fast as a rifle bullet. The aftermath is represented in Step 8.1-9) It all happened in about 1/3 of a second or a blink of an eye or in the perspective of the earth 1280 years. I had a few things going for me such as my use of the push sticks. Luck was with me also because the piece I was ripping hit me directly in the middle of my thick leather belt and now I know why vikings and Scottish used leather armor because that was like a heat seaking missile but it barely dented the belt. It knocked the wind out of me and left me bent over (the diagram is a slight exagerration) but no permanent damage. My right hand had to be bandaged for a few days and coupled with my eye inflection and the throbbing tri-toned tinnitus in both my ears and headache and halitosis I was sort of a mess. I can look back and laugh now because I'm mostly healed. The Tinnitus is worse than ever and if I'm not deaf by 45 it'll be because I'm dead. But I can see and my palm only bears a small scar. Lesson is to wear gloves and a belt when ripping pieces of wood. P.S. The flowers all molded inside the picture frame and are probably infecting the receivers with deadly spores as we speak. Mine will have to be completely redone when I get a chance to fix it. The lesson there is to press/dry the flowers for a duration BEFORE putting them in the glass frame.